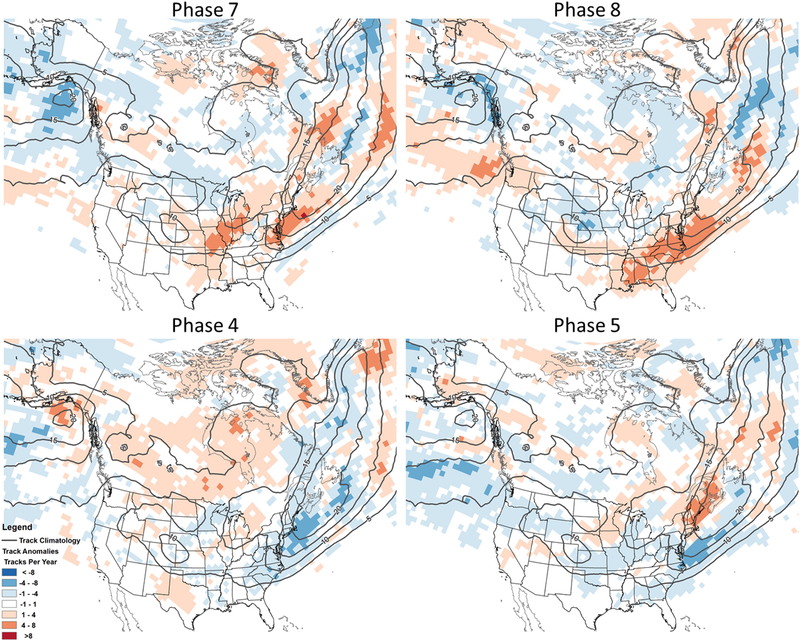 The color shading shows how extratropical cyclone track density varies from average conditions depending on MJO phase, for phases (top) 7 and 8 and (bottom) 4 and 5. The contours show the track climatology for the 1950–2011 period. ETC frequency is higher just offshore of New England for phases 7 and 8, and notably lower for phases 4 and 5. Between January 24 and February 15, 2015, an incredible 90.2 inches of snow fell at Logan Airport in Boston, Massachusetts. Although snowfalls of this magnitude will always have a significant impact, a better understanding of when such events are likely to occur can help cities plan for, and therefore minimize, those impacts. With that goal in mind, a team of scientists, including CICS-NC’s Ronnie Leeper and Carl Schreck, investigated the possible connections between the large-scale tropical phenomenon known as the Madden–Julian Oscillation (MJO) and snowfall events in New England. The MJO is a tropical pattern of atmospheric circulation and rainfall that circles the globe in an eastward direction, making a complete trip around the Earth every one to two months. The MJO is known to influence a variety of weather patterns, but little work has been done to study its effects on snowfall. The researchers relied on several sources of information, including data on the position of the MJO, described in terms of a phase number ranging from 1 to 8; snowfall data for eight stations obtained from NOAA’s National Centers for Environmental Information (NCEI); and a new dataset identifying the tracks of extra-tropical cyclone (ETC) centers, developed by scientists at NCEI, including CICS-NC’s Kenneth Kunkel and Ronnie Leeper. The team discovered a significant relationship between the MJO, the frequency of nor’easter storms (known to produce heavy snowfall in the Northeast), and the probability of snowfall events at most of the stations included in the study. When the MJO is in positions (phases) 7, 8, and 1, chances of snowfall are increased. Chances of snowfall are decreased for MJO phases 4 and 5. In the winter of 2015, more than 90% of the Logan Airport snowfall fell during phases 7 and 8 of the MJO index. While other factors affect whether heavy snowfall events actually occur, these results suggest that the MJO, which tends to be predictable on timescales of about month, may be a useful tool for predicting periods of higher and lower risk for heavy snowfall events in New England.